What Story Would You Tell On Jeopardy? You have 30 seconds. You're on the smartest show on national television. So, what's the most interesting thing about yourself? Ready? Go. 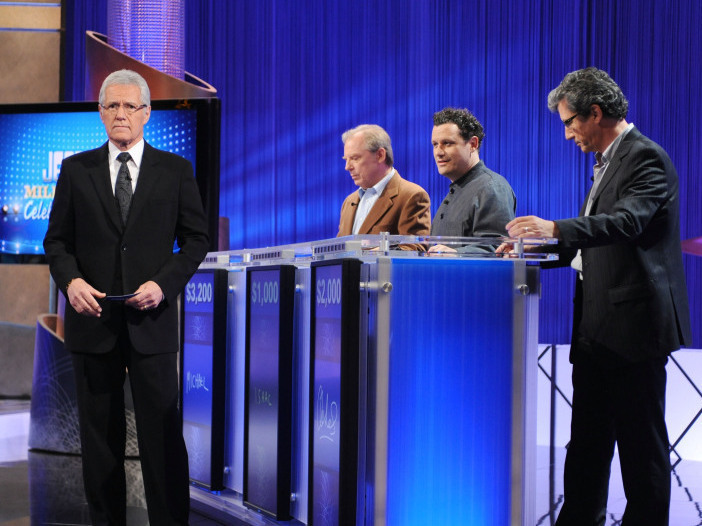 Host Alex Trebek greets celebrity contestants on the set of Jeopardy! For non-celebrity contestants, fame means a 30-second personal anecdote after the first commercial break. Maggie Speak and Robert James are a Jeopardy contestant's best friends: They're the show's main contestant coordinators. Jeopardy is pretty vigilant about keeping contestants separate from production staff — there's no mingling with host Alex Trebek in the green room. So, the contestant coordinators are really your only friends. "On the tape day, my biggest responsibility is getting them ready for their stories," James says. He's talking about the 30-odd-second block of time after the first commercial break when contestants share personal anecdotes with Trebek. Picture that: You're on the smartest show on national television. You have 30 seconds to share the most interesting thing about yourself. What is the one mistake that no one will let you forget? Brushes with greatness and secret ambitions? We want to hear it. Why did you want to be on Jeopardy!? Was it to prove something to yourself or anyone else? These, it is suggested to James, are arguably seventh- or eighth-date-questions. "Most of the time, they're proud of these things!" he says. "It doesn't hurt to put your secret ambition out there." "You put out your secret ambition, somebody might hear it and something might happen," Speak adds. "Fabio once saved my life." "I broke my toe while chasing a bear." "I used to recruit spies for the C.I.A." So that's the bar you get as a contestant. People who run toward bears — not away from them. CIA operatives. When Tricia McKinney got her questionnaire? McKinney appeared on the show in 2007. "I spent hours and hours with that form," she says. To understand the Jeopardy anecdote, you need to understand a few things about the way the show works. First, Jeopardy tapes five shows a day. That means, as a player, you could potentially win five times. Which means five changes of clothes, five personal anecdotes and five games worth of contestants — all in the same room. McKinney describes it this way. "Twelve really twitchy, crazy people who are all dying to go on TV and win a lot of money," she says. "Everybody in the room wants to beat everybody else room." That's where the contestant coordinators come in, she says. "They probably spend half a day just calming everybody down and just making sure nobody throws up," she says. For many contestants, their anecdote is their main source of anxiety. "People tell me that this is the scariest part — this chat thing!" James says. "But the thing is, Alex is so good at his job, he will bail you out no matter what." James sits down with each contestant to settle on three of their best anecdotes from the questionnaire. That often requires more work. Once, after responding to all the questions on the form, a contestant settled on the most interesting thing he could share: "I like to walk." "C'mon — 'I like to walk'?!" James says. "We all like to walk! But we worked with him some more and he came up with some good stories." Three final stories wind up on Trebek's note cards. He makes the final call on what to ask the contestants about. Trebek likes to hear stories about the military, James says. He's been active with the USO. He likes romantic stories, too. "But I can always guarantee that if there's anything about power tools, he's going to want to talk about that," James says. Trebek, apparently, is somewhat of a handyman around the house, Speak says. "People would be surprised at what a mister-fix-it he is!" During the course of her three-game winning streak, McKinney sweated through four changes of clothes. "I was just exhausted by the end of the fourth game," she says. Contestant Dan Suzman didn't win when he appeared on the show in 2004. But he says the personal anecdote was the most exhausting part of his experience. "After that," he says, "you can focus back on the game, on the score." Was he as nervous during the quiz portion as he was during the anecdote? "No, not at all," he says. "I know how to answer questions." Contestants' stories come and go in a matter of seconds. Those seconds are probably the most famous contestants will ever be. Often they're awkward. Often they bumble through it. But in a way, it's comforting that there are still people in America who simply have no idea what to do with themselves in front of a camera — who have the humility to be nervous about taking up your time. In the end, Suzman told a story about being chased by a hippopotamus in South Africa. McKinney told four stories, the last of which was about a trip to Germany with a cousin. The two wanted to remember the location of a shop, so they memorized its street name in German. The English translation was "one-way-street." "It's because there are a lot of one-way streets in Germany!" McKinney explains. "See? This is the kind of material I had to work with!" Today, McKinney skips the anecdotes when she watches Jeopardy. (She did so even before appearing on the show, she says.) "I find them awkward," she says. But after four years, Speak and James still remember her. "She just had a great quality," Speak says. "She was just kind of the perfect contestant." "She came in — she was spunky and fun," James says. McKinney, it seems, was a rare contestant who didn't need much coaching. Speak says, "Often people just don't realize what's interesting about themselves."